Denise D. Dell-Powell is the Chair of Dean Mead’s Bankruptcy and Creditors’ Rights Practice Group throughout Florida. She has more than 25 years of experience in bankruptcy and creditors’ rights, distressed property, dealer distribution and inventory finance litigation, including CMBS foreclosures, workouts and bankruptcy matters. In addition to a focus on banking and financial institutions, her career also includes extensive counsel to the hospitality, restaurant and citrus industries. In Ms. Dell-Powell’s business litigation practice, she has represented parties in federal and state court and has experience trying both jury and non-jury trials. Her litigation practice involves representing clients in a broad range of matters, including those involving real estate, mortgage foreclosure, receiverships, lender liability, commercial evictions, partnership disputes and other real estate based litigation. Due to Ms. Dell-Powell’s legal skills and experience in bankruptcy law, she has earned the distinction of being one of only 900 Fellows nationwide to be elected to the prestigious American College of Bankruptcy. Election to the organization is by one’s peers and based on demonstrating the highest level of character, integrity, professional experience, leadership and community involvement. Ms. Dell-Powell is a frequent lecturer, presenter and author on bankruptcy, restructuring and related issues. 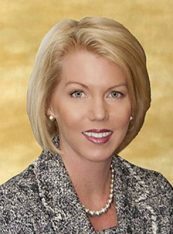 She has presented at conferences and seminars sponsored by the American Bar Association, American Bankruptcy Institute, Trigild, The Florida Bar, The Bankruptcy / UCC Section of The Florida Bar, the Florida Bankers Association, the Jacksonville Bankruptcy Bar Association, the Central Florida Bankruptcy Law Association and Lorman Education Series.